For the past several years, I’ve decided that the first crochet project of the new year would be a hat for donation to Halos of Hope. Why crochet a hat for donation? And why do it for Halos of Hope specifically? The answer is a personal one. I am a cancer survivor – I was diagnosed with thyroid cancer in 2008. It wasn’t at a stage where it was health threatening or life threatening, but having cancer before the age of 40 makes you sit down and think a bit. My mom is also a cancer survivor. She’s dealt with cancer three times, and it was during the third battle, which was the most serious, that I was introduced to the comfort provided by Halos of Hope. Not only was I able to get a couple hats from Halos for my mom, but I also used my time at chemo treatments with my mom to crochet hats for donation to others. I also like the idea that the first thing I make isn’t for me, or someone I know, but for the comfort of a stranger, and I think that puts me in a positive mindset for the rest of the year. This year, using scrap yarn donated by my friend Vickie, I used the Reversible Strands Hat crochet pattern by Nancy Smith (link goes to her Ravelry pattern page). I’m a big fan of this pattern, as it is easy to make and you can customize it quite easily. 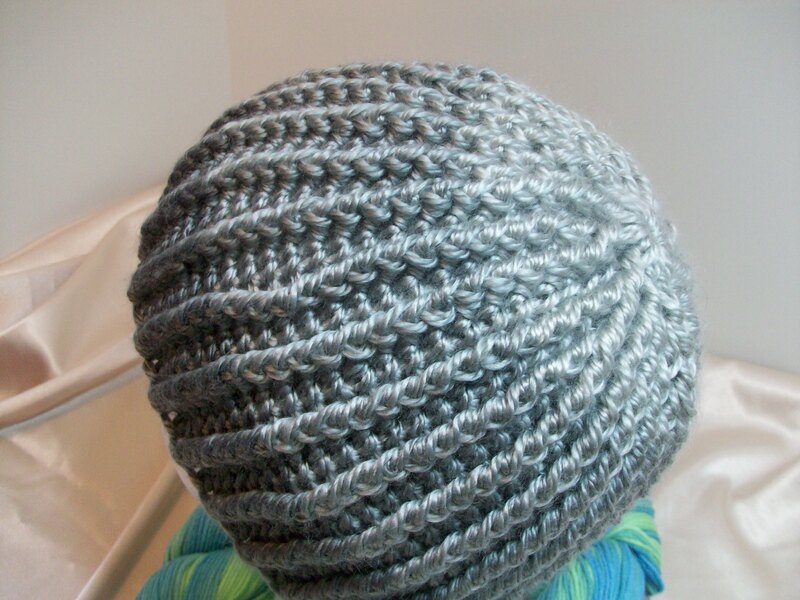 The hat I made uses three colors of grey yarn, from light to dark. Hat as shown is with the rib side out, but you can also wear the hat with the ribs on the inside and the smooth side facing out. One of the things I like about this pattern is that you can change the ribs, so they can go straight down, like this hat, or you can have them spiral. Since I had more scrap yarn I could use for hats, I decided to try the spiral version and it turned out something like this. Three colors on this one again – mid and light grey on the increase section of the crown, and then a heathered blue for the body of the hat. 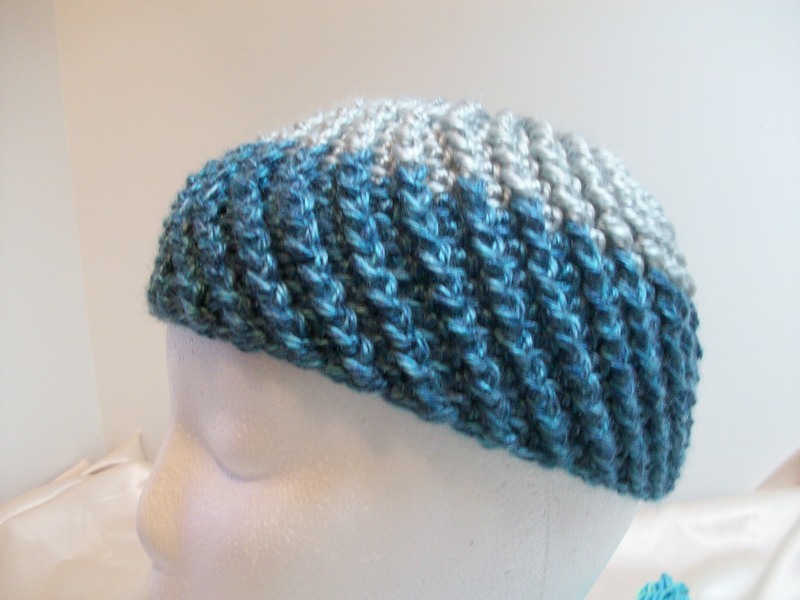 As I was using yarn scraps, this is a smaller sized hat which would be great for a teen or child. I had posted about my hat adventure to my Facebook page on January 1st, which in turn inspired my friend and local knit and crochet designer Jen Lucas to make a hat as well. All this stripy hat making was a stroke of great luck, as Halos of Hope is currently running a January Campaign. Called the 7th Annual Stripe It Up January, it encourages crocheters and knitters to dive into that scrap yarn stash we all have and create some hats that will bring comfort and happiness to others. 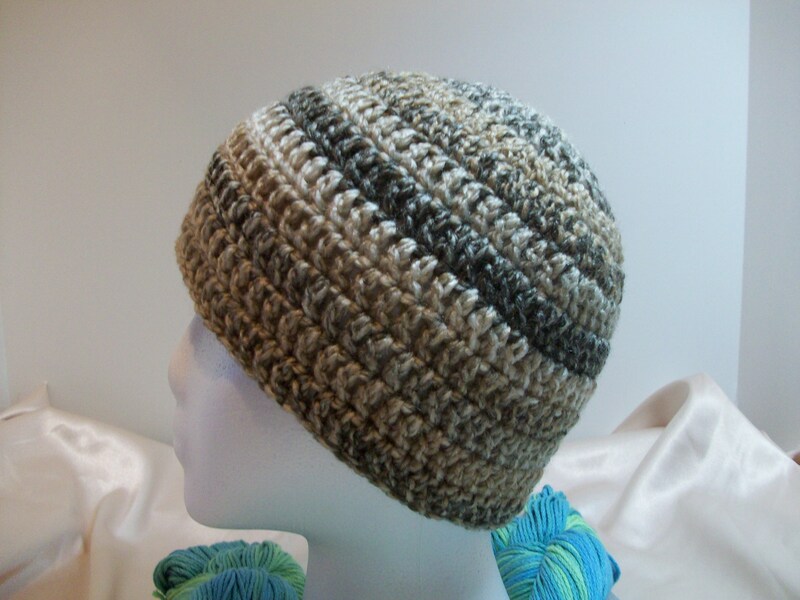 And, if you are unsure of your color pairing abilities, self-striping yarn makes a great hat as well. Check out the Halos website for yarn material choices and hat sizes. All the yarns used in the three pictured hats are acrylic. It’s not too late to join the campaign! I’d love to know what kind of hats you are creating. ETA: Halos of Hope is collecting hats until the end of February 2016 for this campaign! Please check out their website for more information. That is a great pattern. I’ve used it to make several hats for Jen’s hat KAL/CAL. Great for using up scraps. I need to make some more. Running, knitting, crocheting and blogging along.